A 5kW solar system produces on average 20kWh of ENERGY per day. That is obvious. So you size the system to meet the ENERGY and POWER requirements of the building. The battery provides load levelling for the PV. This is sensible and patently obvious. Incidentally, a coal plant cannot do this, it must be sized to meet peak demand, not average. You really have missed the point ! SA is short of generation capacity, it frequently has to import the 600MW max that the interstate connector can supply. The state govmt are planning this 125MW (25MW continuous equivalent) solar "virtual " power plant as part of a solution. Again, the "25MW" proposed solar system has a peak output of 300MW and could do away with up to half the interstate link. I'm not saying this solar system is a good solution for the specific problem or good value, just pointing out the reality behind the numbers to counter your habit of averaging intermittent RE over an arbitrary time period to conclude it is useless. Using your figures..(but ignoring the ludicrous and impossible concept of running a 750MW plant at 25MW).. Lets see how much power SA would get if it invested the $800m cost of the "Virtual" solar plant,, into a coal plant instead ? $800m @ $3.5 /kW ,..would get them a 228MW coal fired plant.....thats nearly 10 times the ENERGY of the Virtual solar plan.and would last a lot longer. .....or they could even get over 1000MW of CC Gas generators ! True. Unless you consider the running cost of a fossil fuel plant which is going to be horrendous over its lifetime. The neat thing about is RE is it's almost fit-and-forget and the fuel is free. Absolutely zilch, nada. Capitalists love that word. Even the $2+ bn for the big coal plant would be a better investment than the billions od dollars they will spend on subsidies and rebates for the RE schemes currently operational. Maybe. If your objective is to be the only First World country building new coal? Maybe you could race the U.S. to be the last country to still be burning coal in the future? Even China is backing off from coal. A huge win for the environment. China has announced plans to cancel more than 100 coal plants currently in development, scrapping what would amount to a massive 120 gigawatts (GW) of coal-fired electricity capacity if the plants were completed. For a bit of context, the entire US has approximately 305 GW gigawatts of coal capacity in total, and this massive adjustment leaves room for China to advance its development of clean, renewable energy. Maybe you could race the U.S. to be the last country to still be burning coal in the future? That will clearly be China and India. Any power plant has to be designed with capacity for the maximum demand it is required to meet..usually with some redundancy also. Often a powerplant will be planned to supply "base load" , with supplimentary "peaker" plants to provide for infrequent peaks in supply if necessary. EG, Gas and Hydro. ......if they become economically competitive.! Note that a thermal plant can provide its maximum "nameplate" power continuously, 24/7, or be modulated to minimum levels as required under demand control. A Solar or Wind plant can only supply as much as nature allows it to , ( often zero !). with no possibility of control to match demand. Wrong !. You are comparing a 300MW peak capacity (limited for 1-2 hrs) , with a 600+ MW continuous feed...often for several days at a time. Those operating costs are all accounted for in the LCOE cost figures previously mentioned. My comments then still apply...you cannot compare variable, intermittent, unreliable , power costs ,..with continuous supply costs ! ....Maybe. If your objective is to be the only First World country building new coal? Maybe you could race the U.S. to be the last country to still be burning coal in the future? If you do not maintain a reliable power supply, you very quickly cease to remain a first world country. Think about this, ...most , if not all, western "first world" economies were built using cheap coal fueled power generation. Some have partially moved to other thermal sources (Nuclear, Gas,) but none have been able to replace thermal generation without huge cost increases which will impact on their economic future. Also, I think it's about time you provided a reference or case study for you repeated claim of "RE always requires 100% fossil-fuel backup" because I can't find one. That's not a reference or case study, that's "name some random countries that have some RE"
Germany has 100+ GW of RE to supply a average demand of Approx 60GW, and a peak of approx 80GW. ! There is no better case to study than Germany, as its the country most invested into RE generation. It has sufficient RE generation to supply 100% of its demand, yet rarely, if ever, achieves that and relies continuously on thermal (mainly coal) generation , (often 100% thermal) ...to keep the lights on. If you do bother to study how well Germanys RE operates, take care to check how much it depends also on its many surrounding countries to help balance the output from its highly variable RE sources . Hint... If Germany were an isolated island....it would not be able to operate its RE to the level it does. Its a small "Pilot" project set up to asses the viability of RE. They have a small demand ..1-1.5MW with over 2MW of wind generation, 0.5MW solar , a 3 MW battery, and a 3 MW diesel plant..plus various other gadgets to manage the RE supply. Just watch the graphic and see how consistent the RE supply is and how often the Diesel generators have to back uo supply or take over completely ! Last edited by Hillhater on Feb 06 2018 6:23pm, edited 2 times in total. But no matter, the Aus Govt is still going to throw fistfuls of taxpayer's money at it. I thought only RE got subsidies?! If you poke about the internet there are a lot of articles recently about how it's a myth RE can't provide baseload power (supported by the details of future energy plans of different countries). Generally the wind is always blowing, or the sun always shining somewhere. And most other forms of RE are far more predictable and reliable. You are comparing a 300MW peak capacity (limited for 1-2 hrs) , with a 600+ MW continuous feed...often for several days at a time. If that 600MW interstate link is being used at full capacity for several days that's a different scenario to what I thought. TBH it's scarcely a peaker supply anymore. If the neighbouring state has power to export then might as well use it. Because it hasn't been done before it can't or shouldn't be done? Considering the pace at which RE is establishing itself as an industry and future technology I'd hazard a prediction that shunning it in favour of propping up a coal industry is likely to be more economically harmful. Many countries are wishfully thinking they can do things concerning carbon emission reductions that they cannot achieve. And will one after the other state one over optimistic goal and then fail to meet it as we already see happening. The forecasts are for India to more than double it's coal consumption by 2040. And even if China cuts it coal use by 10%, it is a matter of semantics since it will still be using more coal in 2040 than all of the rest of the world combined. See the above charts I posted. I can post them again if you like. And easily find plenty more where those came from ate EIA for example showing massive continued coal consumption is forecast for China. There is no way to wish it away. Energy is GDP and no wise country like China is going to shrink their economy drastically in order to curb CO2. Ahh, the World Grid ?... A fantasie ! Which RE are you thinking is predictable and reliable ? ..Hydro ?..GeoThermal, BioMass ? Neither of those can ever be scaled enough to supply primary power for developed nations. Actually, the neighbouring state (Victoria), doesnt have the capacity to maintain that export supply. It is only able to supply SA because..
A). It still has enough thermal generation (just) to provide the capacity....but they plan to destroy that also soon ! B). Other states (NSW, QLD, TAS) form a "Power Relay" to feed Victoria whilst it feeds SA. Which is how a "Grid" supply is designed to work, but in this case its all operating on the limits of total capacity. But with no costs for dealing with variable and intermittent, unpredictable , supply from wind and solar. !
? And shunning a proven reliable power source with out establishing a viable altenative is a sensible plan ?? South Australia's secret game until it lost Vic Hazelwood was to rely on Hazelwood for cheap electricity imports but now the tables have turned around. I don't like to use South Australia as a model for how renewables look because its so small and the smaller the state/power usage the easier it is to make RE look good, I think Germany is a better overall example but it its an incredibly skewed due to its 10GW of still active nuclear that they fully use 24/7 etc. South Australia does have an upside as a raw RE model/example except for the fact that such a large amount of overall electricity is imported via grid that is Victorian coal generation, so its another skew. South Australia in a lot of technical aspects has gone harder in wind and solar for its power-needs than any other country in the world with little 'cheating' and it does have the most expensive electricity in the world as a result, and from that perspective thats why SA is so interesting because its moved to gas and coal-grid imports to force them to rely on wind and solar as much as possible. Again SA has the most expensive electricty in the world. Sure you can answer 'just build more wind' but from the installed capacity point of view they have built enough, thus the real problem is there is just no wind. No wind means no electricity and that means everyone chucking out their frozen/refrigerated food. Just like the blackout the other week in Victoria so many food establishments had to just throw out all their food which is a good example of the cost of pure renewables. Just like if there was no water or food for a day some folks would pay 10 times the amount for it and the same thing happens with electricity and that makes renewables so complicated and this is what makes South Australia interesting as instead of models we get to see a mere fractional window the real world costs of wind as if it was pure (no thermal/Victorian grid) then there would be at times no power-at all. 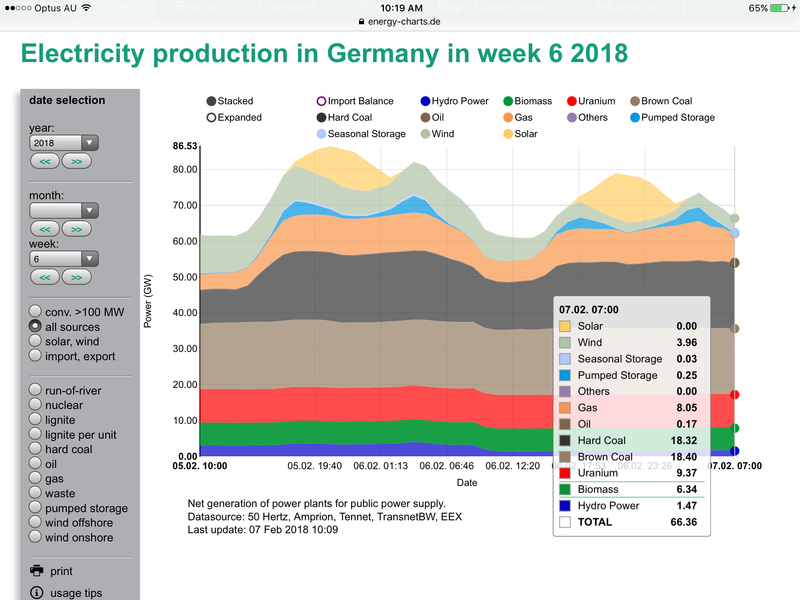 So SA could go closer to Germany model and for example build %500 capacity in wind and solar plus storage, but you need to re-tune the LCOE model of renewables by increasing its price by x5, because in reality, you need x5 the amount of the "claimed capacity" it is currently listed for then its not cheap at all. How many times have we averaged out renewable energy projects and came to a conclusion of anywhere between an average of %15 to max %30 of its claimed capacity The claimed capacity of wind and solar is another Chewbacca defense mind game https://youtu.be/clKi92j6eLE . So you really do need x5 whatever the official capacity the renewables of wind or solar claim and almost everytime the summer vs winter comparison is double, so you technically need a battery solution capable of holding around to 5 months worth of battery storage-power if you go truly pure renewables, how many times have we gone over this. 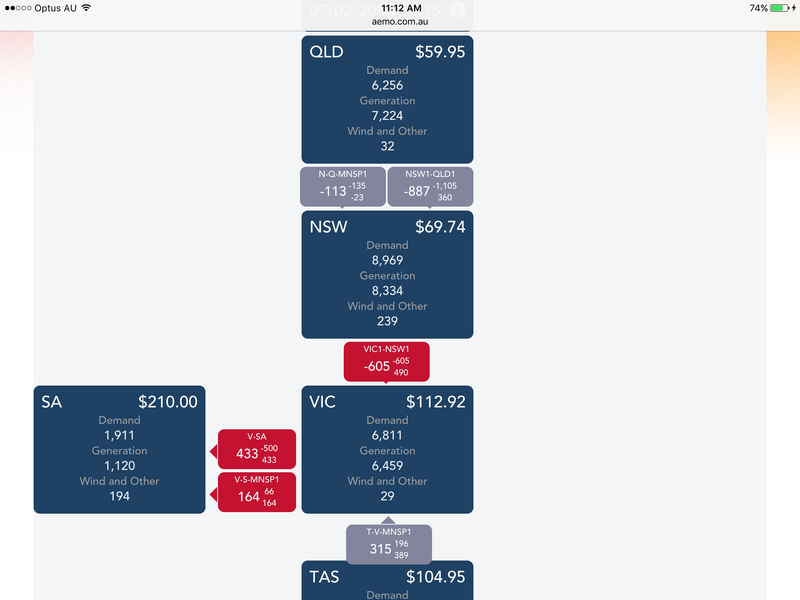 A probably closer LCOE model of wind and solar based renewables with storage is closer to x10 the price the official charts say at a minimum, South Australia and Victoria are not paying for $13,000 a MW/h just for fun its the result of raw need of power-on-demand. The USA data on salt based solar thermal storage power-plants is laughable and not cheap either. There are a lot of people really hurting in South Australia now, they sit in the heat rather than turn on their aircons, I know for most pro-renewables people the attitude towards these people is they should just suffer and die or something along those lines like the DRC children but its not right. If lithium batteries are going to be a long-term future then everyone is going to get EVs, and we are going to need electricity requirements that are mind boggling from what RE are managing to do now, and renewables just can't do it as they stand, the costs just continue to magnify. Just as the day has gone on, its just gotten worse, just like I was saying in yesterdays post https://endless-sphere.com/forums/viewt ... 5#p1356245 today was forecast to be a warm summer day and a proper work day out of the holidays so business are expected to provide aircon to people etc, so far this summer SA has been dodging a lot of bullets IMO. The numbers now show $10,000MW/h and wind has continued to die down as it always has on hot days all summer, the wind just disappears on hot days and returns a few days later when its cooler so it becomes essentially useless. Everytime I look at these sorry charts I think its largely because of the epic brain washing power of ABC news pounding people with garbage information about how great renewable energy is and how the climate is doomed and Getup! 's facebook renewable memes (getup! a leftist political group), a lot of dumb Australians just eat up that getup! baloney. Last edited by TheBeastie on Feb 07 2018 6:55am, edited 12 times in total. Whilst the S Australian state Govmt have established a visible example of a disfunctional power plan, they are not alone. Victoria is rapidly following down the same track forcing coal plants to shut, and even QLD ,..a coal "Anchor" state has pledged to be 50% Re by 2030. Federal Govrmt is no better, playing political word games and setting up commities and control organisations (NEG) to appear to have a plan. The latest thought bubble is to distribute "Smart Meters" to consumers to support a "Demand Management". Program. What that actually means they want to force consumers to change their lifestyle to reduce the demand peaks, and if necessary, they can use smart meters to regulate supply if things get critical. Few in Politics see the seriousness of this situation, with mostly just blame shifting and finger pointing to score political points, Meanwhile , SA steams towards another inevitable power blackout at some point. I dont want to see it happen, because of the cost , inconvenience, and danger, to alll residents, but i fear it will take a major power failure with serious consequences (deaths ?) before something significant is done. Last edited by Jil on Feb 08 2018 4:29pm, edited 1 time in total. But these charts all make his point that solar and wind are fossil fuel extenders. Not replacements. You still need nearly 100% dispatchable thermal back up capacity for the bad days/ weeks. But these charts all make his point that solar and wind are fossil fuel extenders. Not replacements. Given that they have been steadily expanding their percentage of generation, that's not really defensible. It's good to get a rest. Fortunately, renewable energy isn't resting. Solar and wind together in the US have been growing at a rate of 28% a year since 1998. That gets us to 50% solar/wind for our electrical supply by 2027. ..... Solar and wind together in the US have been growing at a rate of 28% a year since 1998. That gets us to 50% solar/wind for our electrical supply by 2027. Great !, however, it doesnt matter how much wind /solar % is installed.... (Germany has over 100% already),.. There will still be periods, days possibly, with little wind generation, and/or solar, which will have to be supported by other power generation systems. Germany simply demonstrates what to expect .....much higher power cost, and no reduction in CO2 emmissions ! Last edited by Hillhater on Feb 08 2018 8:04pm, edited 2 times in total. 2% is a pretty easy number to increase by 28%. Is it ? There are several periods that week also when the Wind/solar falls below 10% of the demand !! And i didnt pick week 6,... That was simply a random link at the time of the discussion. Why dont you check again for today, to see if it gives you any more inspiration ! S Australia ,and the KIng Island RE project, both also with 100+% wind capacity,...are both currently using 80+% Thermal power. Or storage systems. By 2022 the US will be installing 2.5GW of storage a year if the growth rate remains the same; the equivalent of two large nuclear power plants each year. Not really. How much energy does 2.5 GW of batteries store? 5GWh? That is 5 hours of production from 1 thermal plant. Not really. How much energy does 2.5 GW of batteries store? 5GWh? That is 5 hours of production from 1 thermal plant. At full power, yes; it's about 6.5 hours. However, since this storage will mostly be used during times that power consumption is at its lowest (night) then it will represent a longer run time. BESS is not intended to store days worth of energy. It is intended to store a few hours of energy, to store energy from both renewable and standard generation sources to better match load to generation. ......BESS is not intended to store days worth of energy. It is intended to store a few hours of energy, to store energy from both renewable and standard generation sources to better match load to generation. Solar generation is unavailable for 18hrs every day. Wind generation can drop to zero for days at a time. If BESS is not intended to store energy to cover periods of that duration, what is going to do it ? We will have to eventually reshape society to allow for days long blackouts after the fossil fuel gets scarce.